A few years back my husband and I took a trip to San Antonio TX the day after Thanksgiving for a long weekend. While there we spent the evening strolling the streets around the Alamo when we came across an artist selling his space art on the sidewalk. The interesting part about this he was painting them right then and there as spectators watched. It was fascinating to watch him create faraway worlds, moons, cosmic formations and alien landscapes. I could have watched him for hours. When we returned home from that long weekend, I decided to do some space paintings of my own. Space paintings isn’t a new genre of art for me. I actually painted my first outer space painting as a young teen for an arts and crafts show. 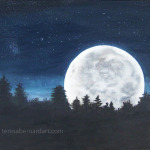 My love of the iconic TV show Star Trek led me to paint the “Starship Enterprise” in orbit around some distant planet. The painting got a lot of attention at that small art show and later sold. 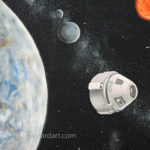 Decades would pass before I did another otherworldly painting and that space art painting was a commission. 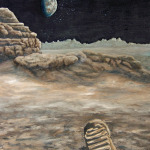 The painting consisted of a lunar landscape depicting Apollo 14’s mission to the moon and man’s first footprint left there. This sparked a renewed interest in creating more space landscapes to add to my repertoire of genre space art. 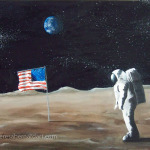 I titled the commissioned painting “Man’s First Footprint on the Moon”. 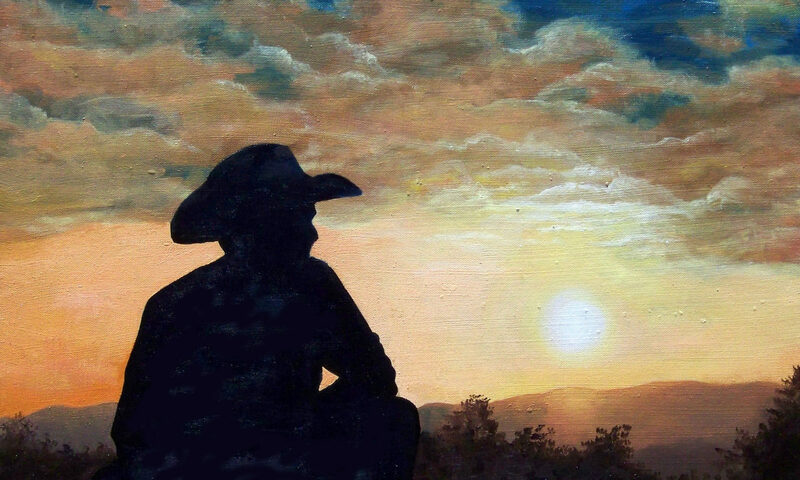 It now resides in the private art collection in Japan at an American military base. A few months later I was also commissioned to paint another cosmic painting. 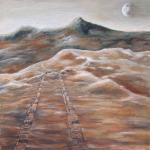 This time it was to be the land rover tracks left behind on the planet Mars.